According to research collected by B2B analyst firm SiriusDecisions, leads sourced by sales typically outperform those coming from other sources. In other words, leads sourced by sales are more likely to become revenue. This is not good news for sales managers, however, as prospecting is not how they want their top sales performers to spend their time. But how do they approach the prospecting process? How is it different than the ways marketers generate leads, and is there anything that we can do to increase the percentages of marketing sourced leads moving through the sales funnel? It is harder than ever to tell the junk leads from the gems. Lead generation strategies like online advertising weren’t originally built to address the needs of B2B marketers. However, B2B marketers are now turning to Account-Based Marketing in order to identify, target, and engage the companies that are most likely to buy. ABM is a powerful strategy for B2B marketers, but at the end of the day, sales teams need to reach actual buyers. How can marketers identify and deliver decision makers at accounts with a real potential to turn into revenue? For B2B companies, it’s far more powerful to reach multiple stakeholders at specific companies than anonymous individuals with the “right” profiles and titles. Unfortunately, current B2C ad technology lacks the ability to target prospects in way that drives revenue in a clear, measurable way for B2B companies. This technology disparity is particularly evident with retargeting, which serves ads to visitors who have previously engaged with your brand online. However, B2B companies had no choice but “borrow” B2C tech – until now with Demandbase B2B Retargeting. It’s the first, ground-breaking technology designed to help business marketers connect their ad investments to revenue. Our “Advertising to Buying Signals with Demandbase B2B Retargeting” webinar will offer insights on why retargeting is so critical to your B2B advertising programs, and share how Demandbase B2B Retargeting helps businesses deliver targeted ads to prospects demonstrating buying intent. Join Adam Greco, Sr. Partner at Web Analytics Demystified, and author of Adobe SiteCatalyst - The Adobe SiteCatalyst Handbook as he speaks with Demandbase customers about their favorite B2B analytic reports. They’ll describe how they have each optimized their existing web analytics package with Demandbase and share best practices for implementing a B2B solution that drives marketing performance. Hosted by the experts at The Pedowitz Group, learn how live engagement through chat, enhanced by real-time ID of companies as they visit your website can help you engage in a relevant way with target accounts and customers, converting those visits into revenue. This session will feature a case study featuring Adobe, and how they saw a 300% increase in conversions through the implementation of chat, through integrated technologies from Demandbase and Liveperson. Is your Marketing Mass Backwards? Move away from marketing to the masses and target the companies most likely to become revenue with Target Account Marketing. How are you Tying and Tracking Engagements and Experiences Across the Buyer 2.0 Journey? SiriusDecisions estimates that the buyer's journey is 70 percent complete by the time a salesperson is contacted -- and a recent CMO Council study of B2B buyers indicates that 87 percent of buyers believe that online content impacts their buyer journey from vendor selection and purchase decisions. In spite of this growing shift to online, most B2Bs organizations have been slow in reacting to the changes with their prospects' purchasing activity, particularly the engagement with their company website during the evaluation process. Yet, some marketers are looking at this rise in "Buyer 2.0" behavior as a problem to be solved rather than an opportunity to be embraced. Join the CMO Council as we delve into the opportunities gained by bringing relevance, precision and personalization across critical digital touch-points, connecting conversations to meet the expectations of today’s connected customer. We will be hearing from Meagen Eisenberg, VP of Demand Generation at DocuSign, who will be sharing how the world’s leading electronic signature solution has more effectively connected with customers, delivering highly personalized experiences in real-time, and exactly where customers are consuming content to shape their buying journey. We will also be joined by a leading thought leader in account-based marketing, Allison Metcalfe of Demandbase, who will share insights into the shifts and requirements of the new “Buyer 2.0”, including the new behaviors that boost the criticality of adopting a more targeted and relevant approach to connected engagements. Buyer 2.0 is the informed customer. They spend most of their buying process independently searching for and accessing information to learn more about the potential impact of their priorities and how to best go about addressing them. For B2B vendors to successfully attract and engage these buyers, new approaches, thinking and technology must be applied. Recent research from Google has indicated that buyers are generally at least 60% through the sales process before identifying themselves to a seller. How do you best identify, engage, and influence the buyer you cannot see? Which website visitors are most likely to become customers? The self-guided tactics of "Buyer 2.0" have many B2B marketing and sales organizations on their heels … but the reality is that the evolved buying cycle should be welcomed as an opportunity to retire the resource-intensive, hit-or-miss sales and marketing models of old and replace them with the proactive, precision-guided engagement efforts which the new B2B buyer is looking for today. 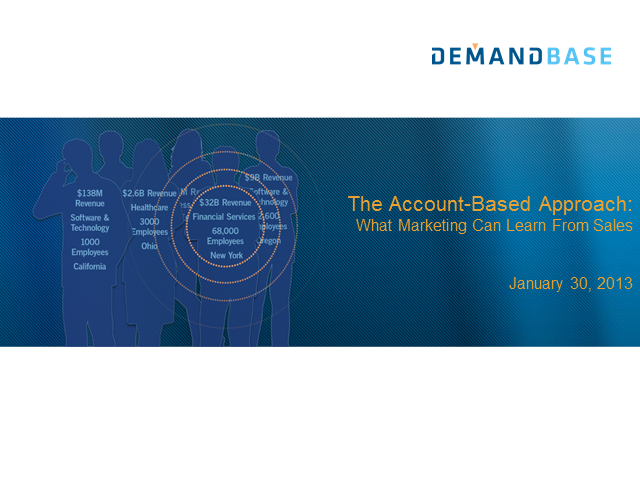 Hear how Demandbase applies real-time ID to account-based marketing. -Actionable ways to think big, start small, and move fast to incrementally improve web conversions of your highest value prospects. Join industry leaders from the top Marketing Automation organizations on the future of marketing automation for 2013! Marketing automation professionals bill themselves as the most progressive marketers in the world, so drawing direction from these professionals will give insight to what is next for progressive marketers. CMO of Demandbase Greg Ott, will moderate the discussion helping frame the direction for the processes, technology and people we will see in the coming year. Also discussed will be challenges and opportunities organizations will see in taking their marketing operations to the next level. Responsible for Marketing and Product strategy and execution, Greg brings experience from both large corporations and startups in B2B and B2C. Before joining Demandbase, Greg was in leadership roles at Classmates.com. Global Marketing at Ask.com, Xoom.com, RealNames Inc., and Procter & Gamble. Heidi is the Chief Marketing Officer of Eloqua, a leader in Marketing-Automation She has also led many of Silicon Valley's most respected technology brands. Ms. Melin led marketing and demand generation efforts at several successful businesses throughout the Bay Area, including Oracle, Polycom and Taleo. Adam is responsible for product management, marketing, and operations. He is a frequent speaker at industry events such as Dreamforce, SugarCon, and American Marketing Association panels. In 2011 Adam was named to BtoB Magazine’s annual Who’s Who list. Jon leads strategy and execution for all aspects of Marketo’s thought leadership and content marketing programs. In 2010, The CMO Institute named Jon a Top 10 CMO for companies under $250 million revenue. Jon holds a bachelor’s degree in physics from Harvard College and has an MBA from the Stanford Graduate School of Business. B2B companies recognize they’re most likely to sell to the accounts that fit the profile of their current customer base. To continually improve quality lead generation, it’s critical to identify the distinguishing characteristics of these customers -- especially because they aren’t always an enterprise’s biggest customers with the most impressive logos. Jennifer Pockell-Wilson, VP of Marketing and Demand Operations at Demandbase, shares tips and tricks on how to build a target account list that both sales and marketing will love. Avoid the pratfalls of list building by focusing on your corporate “sweet spot” – the companies most likely to become revenue. Jennifer Pockell-Wilson leads the demand-focused marketing teams and demand operations at Demandbase. She is passionate about aligning sales & marketing toward common goals through the coordination of language, systems and process. Before joining Demandbase, Jen was the Senior Director of Global Marketing Operations at Polycom and has also spent time at Hyperion, PeopleSoft, Ernst & Young LLP and Lotus Development. Marketing automation systems focus on driving prospects through the marketing funnel in order to identify the qualified individuals that are ready to talk to a salesperson. There are more subtle indicators of interest at the account level, however. Buying signals across multiple contacts that fly beneath the radar when considered individually, and that could be missed altogether if you don’t know what to look for. Lead management and marketing automation thought leaders Adam Needles, Carlos Hidalgo and Matt Heinz discuss incorporating Account-Based selling strategies into B2B lead management and nurture campaigns in this panel discussion moderated by Jason Stewart. Crafting content for the B2B marketplace is a challenging proposition. Long sales cycles, and multiple decision makers mean that the buyer's journey can be frustratingly complex. Creating content that resonates and engages both influencers and buyers at the accounts we value most should be relevant, personal and, most importantly, influential to his or her journey. Meanwhile, B2B websites are still cluttered with generic, "one-size fits all" content designed to convert the generic "buyer persona." What happens when you move to a focused, quality-first personal engagement strategy? What happens if you spend the time to fully engage at the top of the funnel, rather than at some generic "sales handoff" stage. Join Robert Rose, as he discusses the best practices of putting your best content in front of the people at the accounts that matter most. Robert Rose, author of Managing Content Marketing, is the Chief Troublemaker at Big Blue Moose and is a strategist in residence for the Content Marketing Institute. Robert is responsible for innovating creative and technical content marketing strategies for a variety of clients at Big Blue Moose, including AT&T and musician Dwight Yoakam. Driving engagement with sophisticated B2B buyers requires an deep understanding of their business needs and challenges. In this presentation, you'll see a proven approach to buyer-centric marketing. The outcome - personalized, relevant and integrated communications that drive engagement and revenue. Leveraging more than 16 years of sales and strategic leadership in direct marketing, Lauren has been at the core of Babcock & Jenkins’ success for nearly 14 years. She has achieved business objectives with campaign results for companies including LinkedIn, Microsoft, Intel, HP, Adobe, Jive Software, Symantec, Getty Images, NetApp, Sterling Commerce and Starbucks. Ted McDonald- Verisign, Adam Greco - Web Analytics Demystified, Inc.
Demandbase Customer Ted McDonald of Verisign and Adam Greco of Web Analytics Demystified, discuss how to optimize your web experience for the visitors who represent future revenue – your Sweet Spot. The power of personalizing your web experience for your target accounts and Identifying business opportunities that you are missing out on with visibility into your visitors company data. Jason Hekl, Research Director, Demand Creation Strategies of SiriusDecisions and Greg Ott CMO of Demandbase discuss the importance of optimizing your web experience for the visitors who represent future revenue- your Sweet Spot. Hear case studies of organizations who have moved from “flying blind” to leveraging key firmographic data to drive their business decisions. Learn how to win at common B2B challenges, such as personalizing to your audience segments, addressing the home page real estate battle, and uncovering insights into strategic business opportunities. Join Demand Generation industry leaders to discuss the new SiriusDecisions Demand Waterfall. Just unveiled at the recent SiriusDecisions Summit in May, the latest evolution of the Demand Waterfall's re-architecture was released, to incrementally improve insight and effectiveness of the current model. But what impact will this have on organizations? Hear from industry leaders on their key takeaways and strengths and challenges of the new model. Demandbase integrates with other sales and marketing technologies to deliver unique intelligence about web visitors, and better attract, convert and retain the right customers. Enterprise leaders and high-growth companies alike use Demandbase to drive better marketing performance.